We have written about our love of Art Nouveau and are now taking a trip to Brussels in homage of Victor Horta, one of the pioneers and master of this organic and fluid style of architecture. We left England in the 80’s with an appreciation of the French masters in this field but did not become familiar with the Brussels legend until meeting Kareem Abdul- Jabbar also a legend and an Art Nouveau enthusiast. Martin was hired to fabricate the entry door, interior doors and stair rails for his Bel Air residence. When we arrive in Brussels and see Horta’s work in person we will share this experience in a later post. Meanwhile I want to focus on this local residence where the styles of Horta, Guimar and Mucha came together to create a splendid home. The front door was carved from Honduras mahogany as a collection of over-sized irises in a style reminiscent of Alphonse Mucha’s colorful posters. 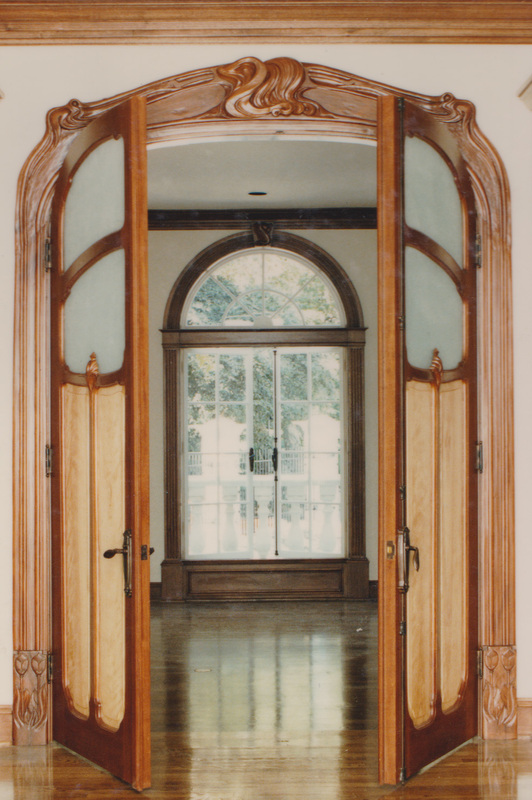 The interior of the front door borrowed its direction from Guimard but for the main archways and interior doors the whiplash center of the casement molding and tweezed hair design of the corners are much truer to Horta’s work. Horta’s aesthetic can also be seen in the large interior doors especially where wood meets glass and the birds eye maple panel is bisected by a central astragal carved as a budding tendril. The stair rail was made in sections of solid bronze using a cow parsley pattern carved by Martin and based on the floral works of Mucha. The White Raven was not the intended title of this post but as an avid viewer of Game of Thrones my ears pricked up when replaying part of season 6 and hearing Sansa tell Jon that a white raven had arrived from the Citadel. In the fictional world of the Citadel, white ravens are purported to be a different more intelligent species to their black corvid cousins hence their fictional black eyes. In reality as author Carrie D. Miller explains, white ravens have leucism which is a condition that reduces the pigment in their eyes and feathers resulting in cream colored rather than white feathers and and blue rather than black eyes. Living in the hills of Hollywood we have the good fortune to see families of ravens on an almost daily basis but only once have we seen a white raven. I can attest that he/she looked perfectly healthy and happy in the presence of his/her darker siblings. The white raven, was as Ms. Miller correctly states more cream and beige in color than white. The sculpture was finished at the same time we saw the rerun of this series and so we decided to make a small video showing the piece in white basswood. To preserve the wood as well create a surface that will release more easily from the rubber mold we have now finished the Raven with a water based varnish. Martin will next begin making molds so that we can get one step closer to creating this piece in bronze. Continuing the journal of Martin Pierce’s Raven sculpture. Following his visit to Big Bear where he was able to see raven’s up close Martin decided he needed to change the pose of his sculpture to show the raven cawing with his beak open and throat puffed to make the distinctive sound raven’s use when declaring their territory or courting. Once captured in pencil, the raven’s 3 perspectives were outlined onto rough wood blocks, one for each section of his body. In deciding how to sectionalize the raven’s shape Martin had to reverse engineer the sculpture by determining how the bronze would eventually flow, where the gates for the bronze could best be added and where thereby the bird could best be sectioned. If Martin had been intending to make only one wood sculpture he would have chosen a wood with more character than basswood and would have sculpted the bird from one block of wood rather than several pieces. However, as this sculpture will be used to create several molds for lost wax casting the sculpture was made so that it could be de-constructed. The raven will be cast in bronze and will be available as a limited edition. The raven will join his feathered friend the scrub jay in Martin’s collection of bronze sculptures, which as well as portraying birds also portrays insects in fictional settings. One of the advantages to old school artistic methods is that they allow the artist to make more immediate design corrections. While CAD does allow the artist to see his virtual sculpture from a 3D vantage, the same holds true for perspective drawings done free hand with pencil and vellum. No doubt the ease and speed of both methods owes a lot to the different ways our brains are wired and to the different way we learn our artistic skills. While Martin Pierce does use a Wacom tablet with built in mouse, for his initial development drawings he finds he can achieve a faster result by adding and erasing pencil lines. This is the same approach he uses when creating custom door handles and as with sculpture, the grid drawings can be placed on solid wood so that the shape can be traced onto the wood’s surface and then cut out with a band saw. While we could use 3D printing to create the pattern, the speed of printing a quick cast SLA model and the cost makes this approach less attractive. By comparison, once a pattern has been sculpted and the artistic and practical bugs sorted out then 3D printing comes into its own if one wants for example to create a left or right version of a piece. We have occasionally used 3D scanning to scan a pattern and then have created a print file that is a mirror image thus allowing a 3D print to be made. The only drawback to doing this is that you end up with a clone of the original and Martin tends to have a preference for asymmetric designs. The Raven sculpture is now taking shape as Martin develops a clearer understanding of this magnificent bird’s wing movement, body stance and general proportion. Having tentatively decided to sculpt a male in pre-flight position, a visit to the Big Bear Zoo is making him question if this is the pose he wishes to capture as a sculpture. Finding a live accessible raven has been a challenge as our local Los Angeles zoo could not help. However, the zoo at Big Bear next to Snow Summit has 2 pairs of ravens and we were allowed to freely photograph them. Day one proved frustrating as neither pair was in the mood to be photographed but on day two we were able to take some beautiful shots of their head profiles, plumage and talons. Equipped with a better understanding of these 4 ravens Martin will turn his focus back to his drawing board to decide what changes he will make to his initial concept drawings.By year end we hope to have a new bird sculpture to add to our collection of bronze sculptures. We celebrated 2018 in Paso Robles with close friends and our dog Iris. 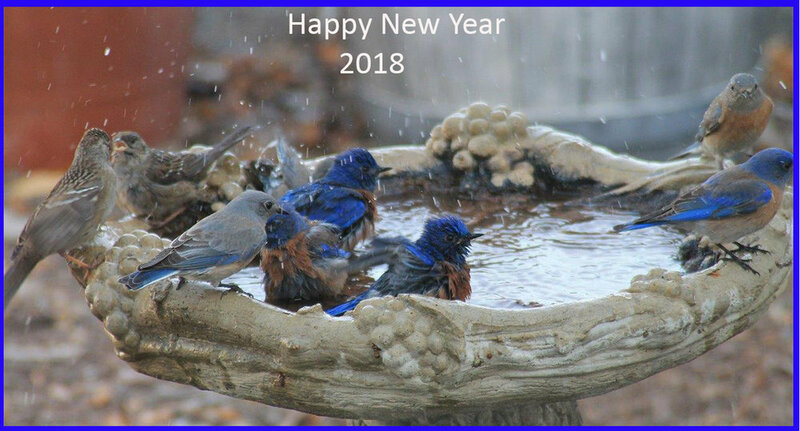 The hikes, chilly air and the bird life all helped to revitalize our moods and energy and so like these Blue birds we enter 2018 with a refreshed perspective. We have incorporated bird designs in both our animal cabinet pulls and in our jay bronze sculpture and will be adding a raven to our collections in the months ahead. While the blue birds shown here are vivid colorful creatures they do not make easy subjects for bronze castings as their markings and multiple colors are difficult to create even with hot patinas. The scale of these small birds with their thin legs is also challenging making it necessary to add an artistic mount to support the heavy body weight. Ravens by comparison have a more uniform color range and stronger legs proportionate to their body size making them perfect as free standing sculptures. We live in the Hollywood Hills and have several families of ravens that we see on a daily basis and appreciate their flying skills, antics and obvious intelligence. Martin has just begun his initial design for this new piece and has decided that the piece will be close to life size at 22” from beak to tail feathers and in a pre-flight position. He is currently hoping to find someone in the Los Angeles area who has a captive raven so that he can photograph the bird from other perspectives so if anyone has any suggestions please let me know. To say that Martin Pierce is fascinated by insects would be an understatement and it explains why insects and their habitat figure so much in his cabinet pulls as well as his paintings, sculpture and furniture. This fascination is not shared by all but we have found that many of our gardening neighbors understand the role that these creatures play in helping to keep their gardens free of voracious caterpillars and from the adult flies such white-fly that they become. At the weekend Martin was able to snap a shot of a beautiful mud dauber wasp, named for the way it daubs mud to create individual chambers for each of its lava. The wasp catches a caterpillar and entombs it in the lava's pod like chamber thus providing a constant food source for the developing lava that when it pupates will emerge as a strikingly colored wasp. The nest chambers are equally impressive and are made of multiple layers of mud built up over a period of days that dry and harden to become robust adobe like homes. Once the caterpillar has been deposited the wasp then lays an egg on it and secures the chamber with more mud. This architectural skill is one that is found in other species and we have seen swallows build nests using a similar approach. What makes the dauber wasp awe inspiring is how she creates her chambers to be just the right size and strength to support the larder and her offspring. Where are her blueprints, where is her scaffolding, apparently they are not required. From all of us here may you have a happy and safe July 4th. The image used here may not be the iconic American bald eagle but the Blue Jay still ranks as a revered and loved bird amongst Americans and non-Americans alike. The sculpture is both a decorative wall piece and a functioning door pull depending on your taste and needs . It is cast in solid silicon bronze and is part of Martin Pierce’s limited edition of art works that include several insect and fantasy pieces. The Blue Jay measures 17”W x 12”D x 4”H. served as inspiration for Martin's latest project--a pair of beautiful candlesticks. Delicate in appearance only, these candlesticks are cast in solid bronze and measure 14" high and 6" wide at the base. They accommodate a "chime" or processional candle with a .5" diameter. This unusual size can be purchased from specialty shops like General Wax in North Hollywood, California. The candlestick shows the succulent just before it flowers with the flower stem serving as the "stem" of the sculpture. The concept was largely based on a succulent similar to those in the Echeveria family of succulents, specifically the 'Black Prince'. You can read more about this plant here. To view our entire collection of architectural hardware please visit our site at www.martinpierce.com.